The Albina Ministerial Alliance Coalition for Justice and Police Reform is sponsoring a rally and march in at Pioneer Square in downtown Portland starting at 10:30 a.m. on Saturday, September 25. 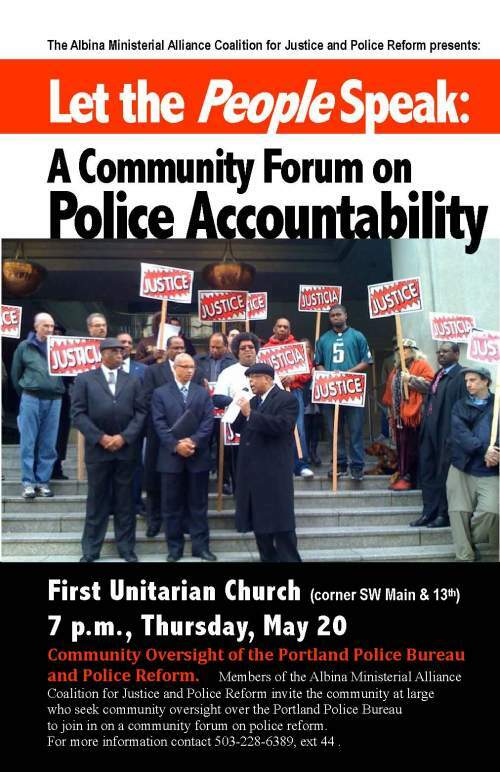 Members of the Albina Ministerial Alliance Coalition for Justice and Police Reform invite the community at large who seek community oversight over the Portland Police Bureau to join in on a community forum on police reform. Download a poster for this event or see it on the street roots blog. Rally for Justice: Stop Police Violence! Check out Portland Copwatch's Feb. 11 letter to District Attorney Mike Schrunk and his reply.